This is a tradition that will carry on for generations! The kit comes with an elf doll and a book. The book explains that Santa has sent an elf to watch over the children and the elf reports back to Santa each night. The kids get to decide the name for the elf together – this is a touch decision! 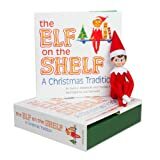 You read through the book with your child, it explains all the rules, then each night you move the elf to a new spot. One of the rules is that the children cannot touch him – this is a great rule because although he’s a sturdy doll, I think he might get loved out much too quickly if they were allowed! The author was so thoughtful to think of all these helpful rules. The kids start searching for the elf immediately when they wake up! Knowing Santa is watching has definitely motivated them to be a behave a bit better! This cute little tradition makes the Christmas season more fun. It’s a very special tradition in our house. I love that the book has an old fashioned feel to it, the illustrations are wonderful. * Your children will ask you every night from Halloween to Thankgiving when the elf is coming back! * You have to remember to move the elf every night! Sometimes this is a bit of a challenge for us. However, our elf does sometimes just get comfy in the spot he’s in, so he must have decided to come back to the same spot. My kids just received this Thanksgiving day as a gift and I am now ordering them for every child I know. It is such a cute idea. Santa sends the elf to watch the children and then the elf reports to Santa every night and comes back to a different spot in the house. My kids wake up with a running start to see who can find the elf first. The kids must name the elf and they really enjoyed that as well. It is such a nice tradition to help make the Christmas Season even more fun and special. I know it will be with our family for a very long time.